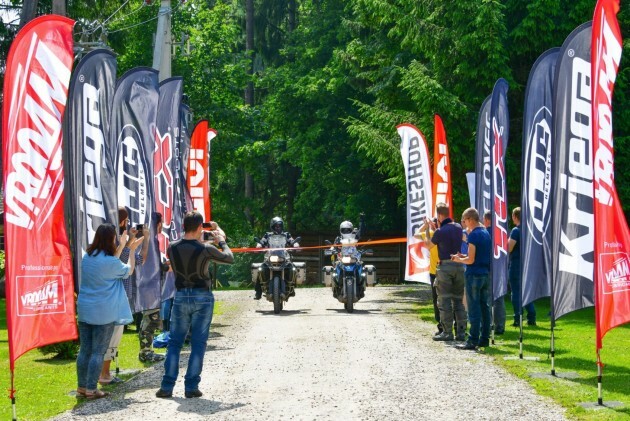 A week ago a campsite with friends and family members near Vilnius marked the end of the round the world trip for two motorcycle enthusiasts Asta Dovydėnaitė and Linas Mockevičius. In 640 days or more than 21 months the two travelers traversed more than 100 thousand kilometers and visited 45 different countries. This experience will forever cement itself in their memory not only because of the thousands of photos taken during the trip, but also because of a new mention in the Lithuanian record books. They have become the first Lithuanians to cover this much distance using motorcycles. Having been welcomed warmly back in their homeland the two travelers agree that the first few days are best described as being odd and slightly confusing. Granted, the two had some time to get used to Lithuania already as entering the country thorough its Northern border meant that the last few hundred kilometers they had to complete were covered on Lithuanian roads. "On our first day back in Lithuania we kept mentioning each tricolor that we saw on our way until we finally got used to the fact that seeing our flag in Lithuania isn't that big of a deal. Now we feel like we got used to being back home. I am extremely happy with our decision to make one last round around Lithuania before we reached our final destination. We crossed Joniškis, Klaipėda, Marijampolė. Through Druskininkai and Varėna we headed for our final stop" – explains Asta. After two years of being away from home, Asta says that the most pleasant surprise after returning is the beauty of Lithuanian cities, towns and villages. Everything is tidy, the sides of the road are clean, and the drivers they met on the road were well mannered and drove impeccably. "While reading the news we found a lot of negative information, but when we returned and saw everything with our own eyes we understood how beautiful our homeland is. In the context of Europe as a whole we can take pride in knowing we look great" – Asta explains. The record holders to be are very open about missing their family while being abroad and say that the first few days were relegated to meeting everyone. "We really missed our relatives from older generations, since communication with them using modern technology was rarely possible"
Aside from traveling on two wheels Asta has another passion – horseback riding. As soon as she came back she rushed to Priekulė, so she could ride her favorite horse. "Horseback riding was what I missed the most. I have been in love with it since childhood and it always soothes my soul. Where the longing for family and friends can be remedied slightly by talking to them over the phone, it is impossible to do that with your horse. So I am happy that I already managed to squeeze in some riding after our return"
With one of the biggest adventures of their life behind them, the two riders from Vilnius are not planning to rest anytime soon. Their next goals are centered on job and house searches as well as finding a means of transportation suitable for winter. Both of them jokingly say that they will try their best to integrate back into normal life. Amongst the most pressing future plans is also the official registration of the record. The record monitoring agency "Factum" is already eagerly awaiting details regarding their trip and to the pleasant anticipation of the duo should soon officially declare the record. 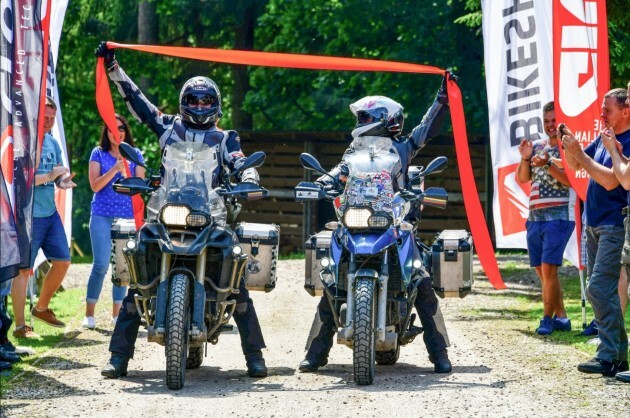 The soon to be record holders are extremely pleased with their steel companions the two touring motorcycles "BMW F 650 GS" and "BMW F 800 GS Adventure" which easily completed the impressive challenge. According to the two globetrotters, the few small technical hitches they encountered they solved on their own. They were also really pleased with the two year global warranty, which meant that they would skip any queues in any official BMW dealership to quickly change a few parts that got damaged on the way. Starting the trip in October 2016, Asta and Linas traveled from Vilnius to Hamburg, in order to cross the Atlantic the duo had to ship their motorcycles to Chile while they took a flight to Brazil. Once there for a while they traveled with only their backpacks. After crisscrossing the South Americas they headed towards Central America and then to Alaska. Once back on the west coast they traveled to South Korea, the wast expanses of Russia followed before they headed to Central Asia and Iran, from there the two had to ship their motorcycles to Kenya. At the beginning of May, after five unforgettable months in Africa the two travelers returned to Europe. Through the myriad of Swiss, Austrian, Czech and German villages they traveled to Norway and its Northern Cape. After reaching the far North, Asta and Linas through Finlands, Estonia and Latvia started their final leg of the trip back home.